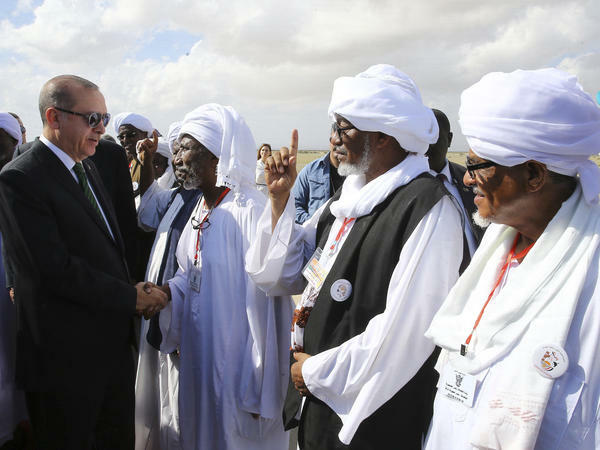 Turkey's President Recep Tayyip Erdogan shakes hands with local people in Port Sudan, Sudan, on Dec. 25, one of many locations in Africa the Turkish leader has visited recently. 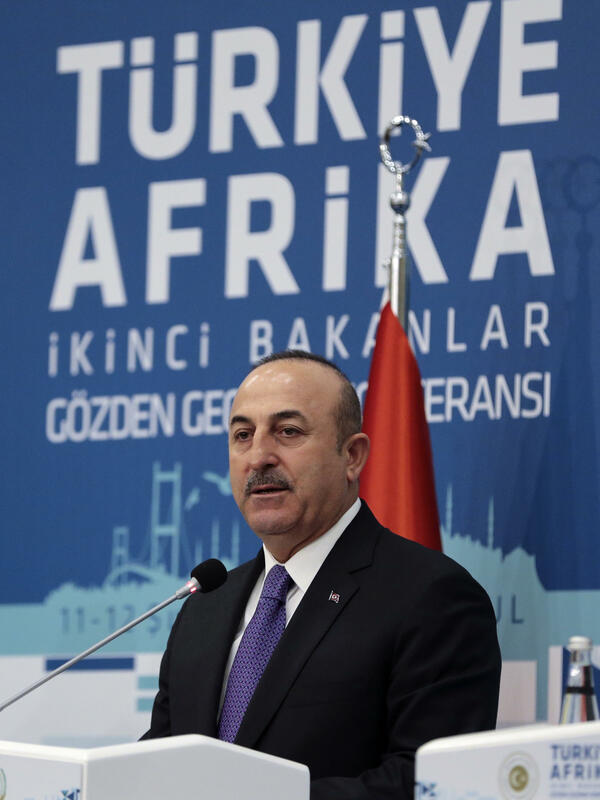 Turkish Foreign Minister Mevlüt Cavusoglu speaks during a Turkey-Africa conference in Istanbul, on Feb. 12. 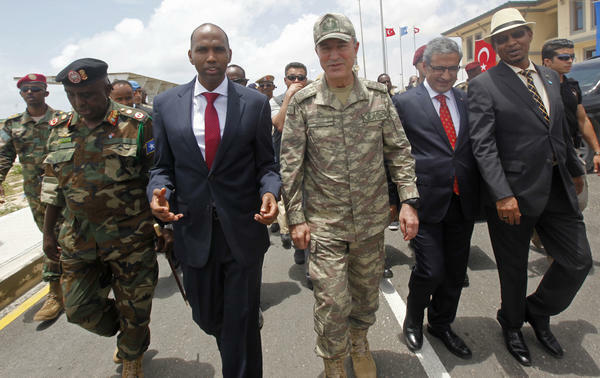 Turkish Armed Forces Chief of Staff Gen. Hulusi Akar, center, and Somali Prime Minister Hassan Ali Khayre, second left, tour a new Turkey-Somali military training center in Mogadishu, Somalia, on Sept. 30. 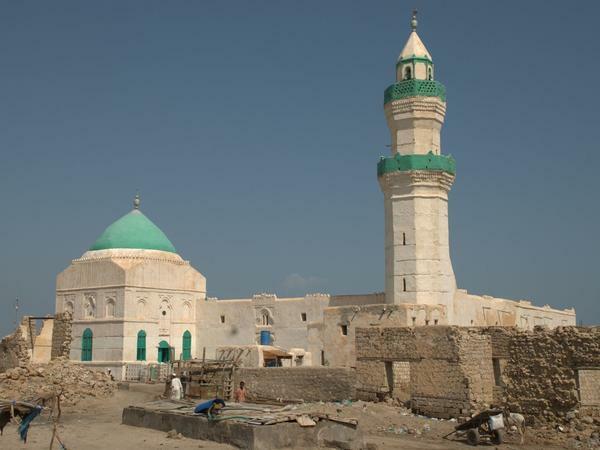 The el-Geyf mosque on the island of Suakin, Sudan. Dozens of African government ministers milled about an Istanbul hotel ballroom recently, planning for next year's African Union-Turkey Cooperation Summit. During a break in the meeting, Abdulkadir Ahmed-Kheir Abdi, Somalia's state minister for foreign affairs, praised Turkey's assistance to his country plagued by famine, civil war and an Islamist insurgency. "Turkey came to Somalia first in 2011, when no one dared to go to Somalia," he said. "There was a drought, there was a famine, there [were] terrorist activities there, and everyone stayed away." When President Recep Tayyip Erdogan and his wife got off the plane in Mogadishu and visited a camp full of starving children, Abdi said it was a powerful moment. And when Turkey pledged aid and signed trade agreements, he said, other countries followed. "So for us as Somalis, Turkey is in our heart because of the help they provide in the time of need," Abdi said. Since 2003, when current President Erdogan began serving as his country's prime minister, Turkey has been a growing player in Africa. Erdogan has made more than 30 visits to the continent since coming to power, including a visit earlier this month to Algeria, Mauritania, Senegal and Mali. He returned calling the tour "productive," and tweeted, "We want to walk with Africa while a new world order is being established." Analysts say Turkey has a host of motivations, from cultural to economic to geopolitical. In the last 15 years, Turkey's trade with African countries has grown sixfold to $17.5 billion, according to the official Anadolu news agency. Much of that trade is with North African countries like Egypt, but Turkey is also expanding its presence south of the Sahara. There are now over 40 Turkish embassies in Africa, and state-controlled Turkish Airlines flies to more than 50 African destinations. Last fall, Turkey opened a military base in Somalia, its first in Africa and the largest of its overseas bases. If you get sick in Somalia, you may be treated at the Recep Tayyip Erdogan Hospital. Visitors arrive at an airport terminal run by a Turkish company, and travel on roads built by Turkey's development authority. Garbage collection is handled by the Turkish Red Crescent. There are questions, however. Critics among international nongovernmental organizations and pro-transparency groups note that Turkey's involvement was facilitated by noncompetitive Somali contracts awarded by a state notorious for its corruption. Following advisers' recommendations, the government in Mogadishu has begun renegotiating some of those contracts. Somalia isn't the only troubled African state where Turkey is making a splash. Turkey is also boosting its presence in Sudan. Erdogan recently address the Sudanese parliament and spoke warmly of the country's strongman Omar al-Bashir, who is accused of war crimes by the International Criminal Court. "Me and my brother al-Bashir will talk business, and I'm sure we will leave this place with handshakes on a number of big partnerships," Erdogan said. Sudan granted Turkey a long-term lease and rights to restore Ottoman-era buildings on Sudan's Suakin Island in the Red Sea. The island was once a stopover for Muslim pilgrims heading to Mecca. Sedat Aybar, director of the Africa Research Center at Istanbul's Aydin University, says burnishing Turkey's credentials as a defender of Muslim heritage is part of the motivation for the Suakin Island restoration project. The government is interested in "reactivating the Turkish memory chip" about the Turks' presence in African territories the Ottoman Empire controlled until the late 1800s, he says. This, he says, "is a very important part of restoration of ruined Islamic sites on the island." But the primary motivation for the country's push into Africa is economic. Africa has natural resources that Turkey needs for its manufacturing and industrial sectors, including oil and gas, and Africa needs income, infrastructure and jobs for its people. Aybar sees Turkey's military presence in Somalia more as a long-term economic investment than a show of Turkish might. With large areas of Somalia still under the control of al-Shabab extremists, Aybar says a better security environment is key to improving the East African country's economy. And that helps Turkey too, he says: "A stable and more secure Somalia will provide Turkey with more positive economic returns." The Turkish Empire in the Middle East is gone, but Turkey is making new inroads in Africa. Over the past decade, it's been investing in some of the continent's most troubled countries, and Turkey is expecting to see some benefits in return. NPR's Peter Kenyon reports. PETER KENYON, BYLINE: Dozens of African ministers milled about an Istanbul hotel ballroom recently, planning for next year's Turkey-Africa summit. Off in one corner, Abdulkadir Abdi, minister of state from Somalia, is lavish in his praise of Turkey's assistance to a country plagued by famine, civil war and terrorism. ABDULKADIR AHMED-KHEIR ABDI: Turkey came to Somalia first in 2011 when no one dared to go to Somalia. There was a drought. There was a famine. There was terrorist activities. There was a war, and everyone stayed away. KENYON: When President Recep Tayyip Erdogan and his wife got off the plane in Mogadishu, went to a camp full of starving children and began pledging aid and signing trade agreements, Abdi says other countries followed. ABDI: So for us as Somalis, Turkey is - it's in our heart because of the help they provide in the time of need. KENYON: It's part of Turkey's growing presence in Africa. State media report Turkey's trade volume with Africa is at least six times what it was in 2003. And Turkish Airlines flies to more than 50 African destinations. If you get sick in Somalia, you may be treated at the Recep Tayyip Erdogan Hospital. Visitors arrive at an airport terminal run by a Turkish company and travel on roads built by Turkey's development authority. Along the way, they may see the garbage being collected by the Turkish Red Crescent. There are questions, however. Critics note that Turkey's involvement was facilitated by non-competitive Somali contracts awarded by a state notorious for its corruption. And Somalia isn't the only troubled state where Turkey is making a splash. President Erdogan recently addressed the Parliament in Sudan. He spoke warmly of Sudanese President Omar al-Bashir, who has been accused of war crimes by the International Criminal Court. PRESIDENT RECEP TAYYIP ERDOGAN: (Through interpreter) My brother al-Bashir and I will talk business, and I'm sure we will leave this place with handshakes on a number of big partnerships. KENYON: Turkey was granted a long-term lease and rights to restore Ottoman-era buildings on Sudan's Suakin Island in the Red Sea. The island was once a stopover for Muslim pilgrims heading to Mecca. Sedat Aybar, director of the Africa Research Center at Istanbul's Aydin University, says burnishing Turkey's credentials as a defender of Muslim heritage is part of the motivation for Turkey's efforts in Sudan. He calls it reactivating the Turkish memory chip regarding the territories it once controlled in Ottoman times. SEDAT AYBAR: So that kind of reawakening the memory chip that Turks has been in the continent is a very important part of restoration of ruined Islamic sites on the island. KENYON: But Aybar says the primary motivation is economics. Africa has natural resources that Turkey needs for its manufacturing and industrial sectors, and Africa needs income, infrastructure and jobs for its people. Aybar says money also explains Turkey's military presence in Somalia, where a Turkish base is used to train Somali soldiers. With large areas of the country still under the control of al-Shabab extremists, he says a better security environment is key to improving Somalia's economy. AYBAR: And this is particularly important as Somali, a failed state, it requires building up military capacity. A stable and more secure Somalia will provide Turkey with more positive economic returns. KENYON: Aybar says Turkey's decade-long embrace of Africa is now irreversible. President Erdogan has made more than 30 visits to Africa since coming to power, and he recently embarked on another tour, this time to four countries in North and West Africa. Peter Kenyon, NPR News, Istanbul. Transcript provided by NPR, Copyright NPR.